NEW YORK TOURS BY GARY : Once there was a valley, Clendening Valley. Once there was a valley, Clendening Valley. I love this print. Look how happy everyone appears to be; the mother with her parasol, the father in his best top hat strolling along holding his son's hand. The girl playing with a hoop and the couple promenading north on Second Avenue at 42nd Street in 1861 have an air of contentment. But the house up on that cliff looks precarious. As soon as Europeans showed up on Manahatta, the task of taming the island began. As the city grew in population and the boundary inched ever northward, more and more of the original landscape disappeared into oblivion in the name of progress. Forests felled, streams filled in, swamps drained and hills leveled. And when we imposed a grid upon the island, all of those streets, all of those right angles were cut through making the streets level. After all, it was a horse drawn world when the grid was being cut through those hills, and would it not be easier on the beasts if they had a level path. This scene was all too common and those streets that were cut through were very often muddy gullies, not the idyllic scene with a house that could fall over any second presented here. This is a great record of a great city undergoing yet another transformation. However some hills could not be tamed, especially if the word "valley" is attached. Manhattan Valley, where the subway was forced to come out of the ground as it dropped, only to go back into a tunnel as it rose again; and Clendening Valley which centered on Columbus Avenue approximately between 104th street all the way to 94th street with 96th street the bottom of the valley. This is the Clendening Mansion. 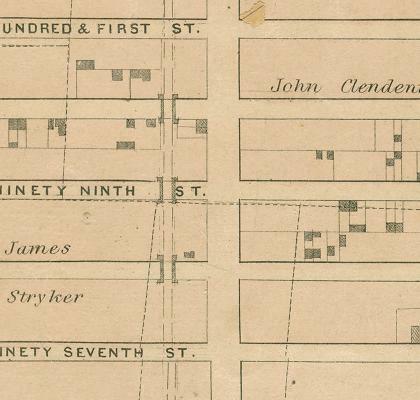 This print from Valentine's Manual lists the location as 90th Street and 8th Avenue. This is incorect. John "Lord" Clendening was a wealthy New Yorker who made his fortune importing Irish textiles after the Revolution, at the end of the 18th century. 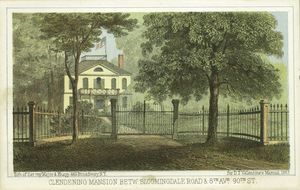 He built this lovely mansion, complete with widow's walk and waving American flag, around 1811. It stood at what is now the southwest corner of Amsterdam Avenue and 103rd Street, in the northern fringes of the area known as Bloomingdale. As the grew, so did the demand for a clean reliable water source. Early New Yorkers were incredibly dumb when it came to clean drinking water. They were very adept at polluting their water sources. Finally someone put it together and figured that all the garbage strewn ponds and wells (some wells too close to cemeteries that contained the bodies of those who had died in cholera epidemics) were killing them. Long story short, and it is a long story, after building the Erie Canal system nothing seemed impossible. 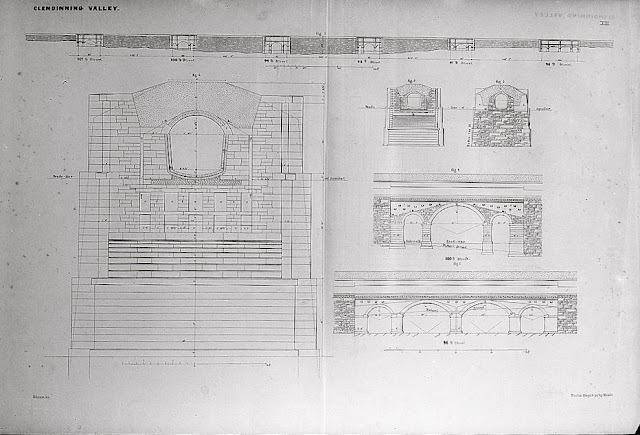 So supervised by Chief Engineer John B Jervis (like in Port Jervis, who had served as one of the engineers of the Canal system) an aqueduct system was designed to bring water from reservoirs in Westchester County all the way down to City Hall Park. Bringing water by the force of gravity alone, New York City's first aqueduct system sent water 41 miles through stone aqueducts which for the most part were underground. Except in Clendening Valley. Because of the dip in the landscape a plan had to be hatched. This is a plan of the plan. The streets that had been laid out in 1811 were to be accommodated by arches in a great stone wall carrying the brick conduit which was lined with iron. This is what they were going to look like. However the "Whig" party had gained control of the state legislature. This party was against wasting taxpayer money on arches through an aqueduct as they were firm believers in less government and lower taxes. They won their fight to scrap the idea of arches in favor of a solid wall of Manhattan Schist running the entire length of the valley. Realizing the obvious, an unbroken wall would be a barrier to development, in the first veto ever by a New York City mayor, Democrat Isaac Varian prevented the walling up of the valley . A compromise was reached and the wall was to passable in three places - at 98th, 99th, and 100th streets. The wall completely blocked the paths of the future 96th, 97th, and 101st Streets. This bucolic pasture is between the future 98th and 99th streets. Unless we are facing west then this could be between 100th and 99th streets. 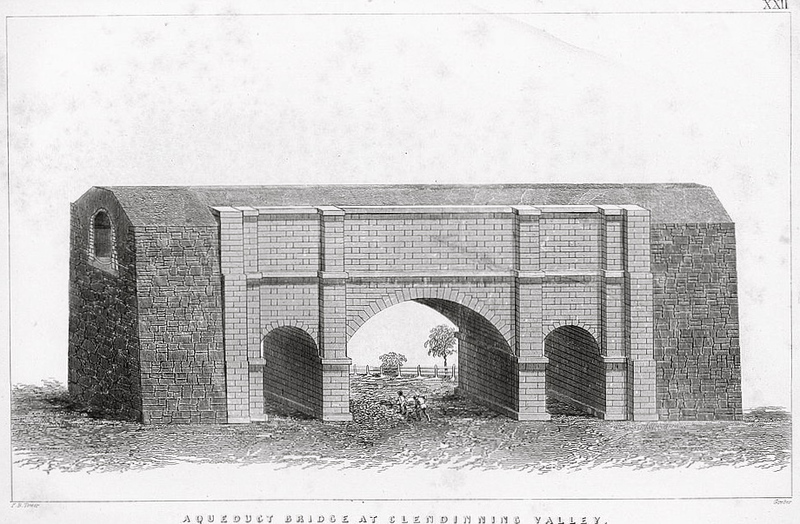 The Aqueduct ran between Amsterdam and Columbus Avenues closer to Columbus. There are the arches on the map from 1868. The streets and sidewalks of 98th, 99th, and 100th streets passed beneath those arches. The Clendening estate stretched from the north side of 99th Street to the south side of 105th Street and from Central Park West to the Bloomingdale Road. The estate was lost in 1845 and the farm disappeared within 20 years. 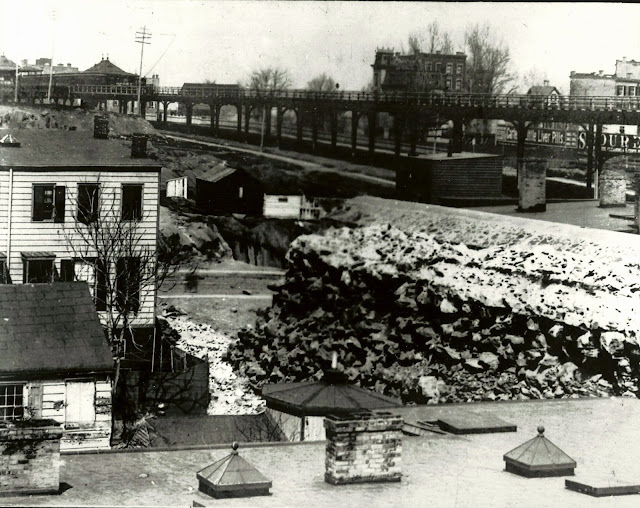 By the 1870s, development demanded more water; the above ground aqueduct section was buried underground into a pipe siphon and the solid wall blocking 96th, 97th, and 101st Streets–along with the arched 98th, 99th and 100th streets - was torn down. Again, the map from 1868. The name John Clendening appears on the map although Clendening had lost the land years earlier. 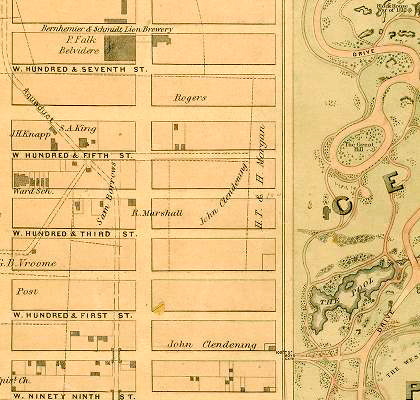 The diagonal line from where the aqueduct crosses west 105th street south west to just south of 103rd street and then west was called Clendening lane. The lane ran over to the plot of land that was the site of the old Downes Boulevard Hotel on 103rd street and the Boulevard (now Broadway). There are remnants of the intersection of the lane and the aqueduct on the south side of 105th street between Amsterdam and Columbus Avenues just east of P.S. 145. Best to observe it using bing or google maps. This is looking northeast from just south of 101rst street between Amsterdam and Columbus Avenues. The 104th Street 9th Avenue El station is in the distance and the remains of the aqueduct through Clendening Valley are in the left foreground. This is quite possibly the remains of the arch-way at 101rst street. 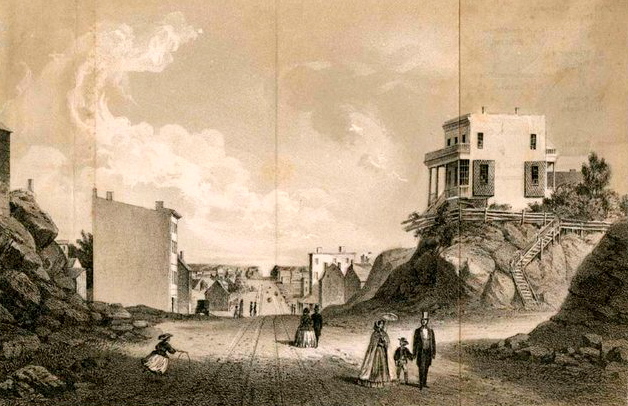 The original Croton Aqueduct, one of the most important pieces of what made New York City, opened June 22, 1842, taking 22 hours for gravity to move the water the 41 miles to Manhattan. Almost immediately it was woefully inadequate. 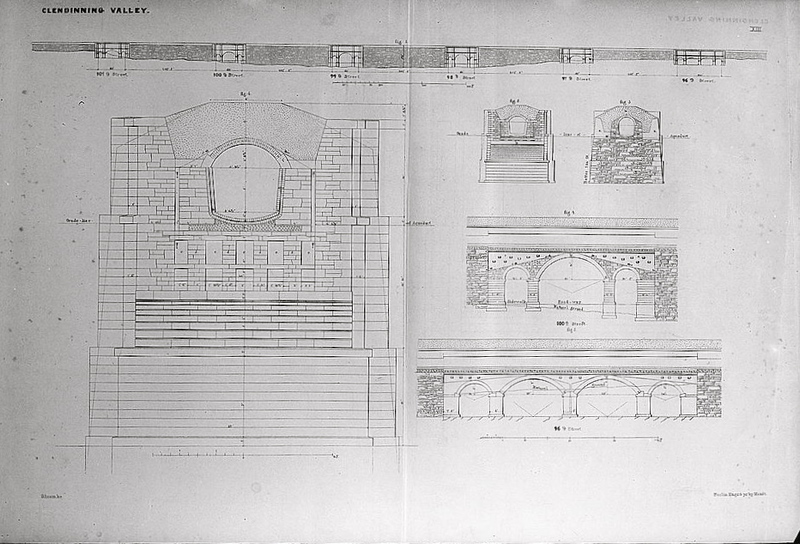 Construction on a new aqueduct began in 1885. The new aqueduct, buried much deeper than the old one, went into service in 1890, with three times the capacity of the Old Croton Aqueduct. Clendening lived on his rural estate for many years, but in 1836 he lost most of his money when President Andrew Jackson refused to renew the charter of the United States Bank, in which Clendening was a major stockholder. 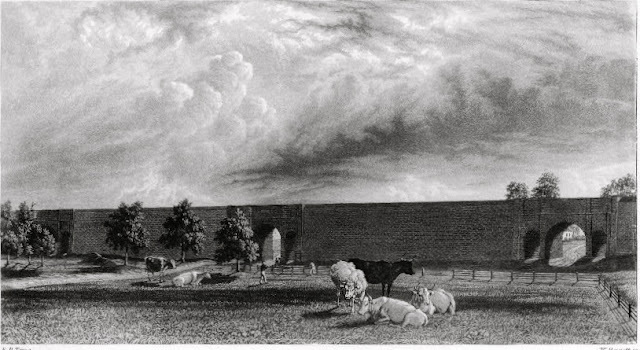 The estate was sold in 1845 as forty lots for a total of $4500. Although the mansion was torn down the area was known as Clendening Valley well into the post civil war 19th century New York. 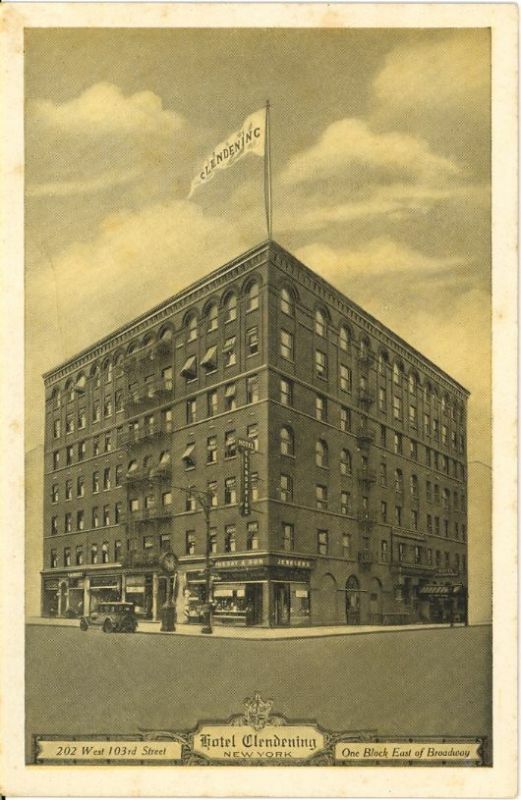 On the site where Lord Clendening's house one stood, the Clendening Hotel rose in its place on the west side of Amsterdam Avenue at 103rd street. The Hotel survived until 1965 when it was torn down for furthest west building of the Douglas Houses complex. Did you mean 100's of lots or 100's of blocks? Of course if he had 100's of blocks he would have made out like a bandit and would certainly have lost nothing. It has been a while since I posted this and I cannot remember which source I used. I tend to rely heavily on the New York Times archives as well as various books. Peter Salwen's Upper West Side Story, Andrew Dolkart's Morningside Heights, New York 1880 and 1900, the Columbia Guide to New York as well as Hopper Striker Mott's The New York of Yesterday - A Descriptive Narrative of Old Bloomingdale. I also rely too much on my memory of all that I have accumulated over the years. So Don, if I have offended you I am sorry. However I am not writing a doctoral thesis, I only wanted to show originally just for a group of friends who had moved to grayer pastures (meaning away from NYC) the history they left behind. How important NYC is and always should be. By I.N. Phelps Stokes. He has Clendening passing away on January 27th 1836. The farm, called Sharon, was given to his wife the rest divided up amongst his children.